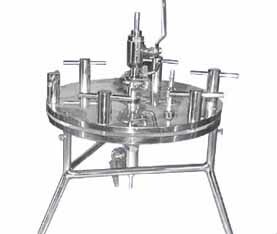 Made out of S.S.316 quality S.S., suitable for filtration of sterile liquids. The unit is provided with TWO silicon gaskets support screen with non-sticking mirror finish with bolts & wing nuts. An air escape valve is also fitted to remove inside air. Stainless Steel parts polished as matt finish by 120 grit. Size: 142 mm. dia. with bubble test arrangement. Size: 293 mm. dia. with bubble test arrangement.